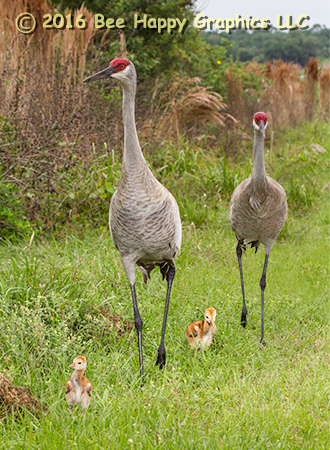 This image of a new sandhill crane family was taken in late March at Circle B Bar Reserve. We learned about this reserve from visitors to our booth at a nearby art festival (and it is where Nancy saw her first bobcat). 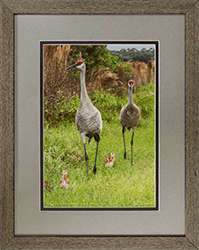 Sandhill cranes mate for life and start breeding when between two and seven years old. They live around twenty years. Females usually lay two eggs, but typically only one nestling survives to fledge. Juveniles will be with their parents up to ten months. 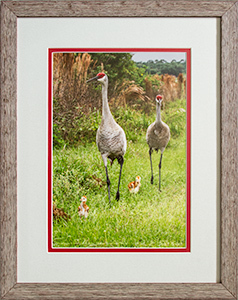 In another example of how we learn from our visitors, we had a framed version of this image hanging in our booth when a lady asked Nancy if she knew how old these chicks were. 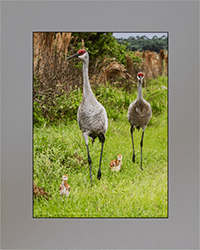 Nancy, being born, raised, and living in Miami, which is south of the sandhill crane's range, was not intimately familiar with their life history even though we have seen plenty of sandhill cranes on our travels throughout the state. She guessed the chicks were maybe two weeks old. Turns out they are only about two days old. Apparently the chicks hit the deck running and grow fast. Photographic details: Canon EOS 7D camera w/ EF 100-400mm f/4.5-5.6L IS USM lens set at 115mm. Flash was used off camera (as described in the last paragraph of this blog post). Camera was on f/11 for 1/125 sec at ISO 250. Fine Art Paper 16" x 11" 25" x 17"
Canvas N/A 36" x 24"